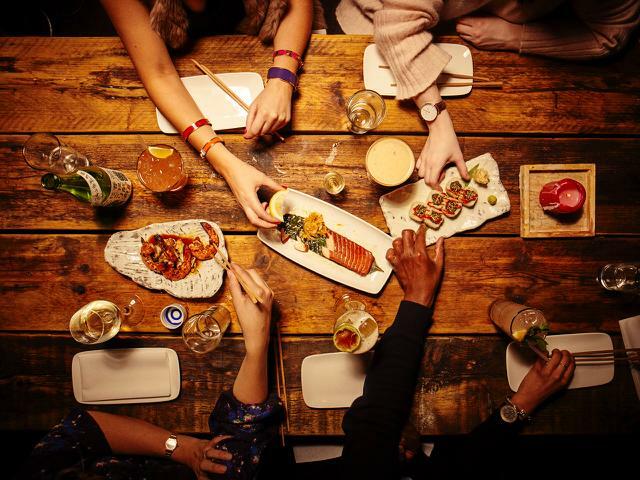 Drawing influence from the ‘Izakayas’ (a type of pub) in Japan, Kurobuta on the King’s Road in Chelsea has been wowing customers and restaurant critics since opening following a hugely successful pop up just down the road. Kurobuta came about after the Australian born Scott Hallsworth decided to leave his role of Head Chef at Nobu and create more than just signature dishes; his vision was to create a new brand, based upon the Japanese pub culture, using Japanese ingredients but with a modern, and sometimes, Western twist. Together with the ex-Nobu Financial Controller, Andrew Stafford, they created what is surely one of the most ‘must visit’ restaurant experiences in London. The menu is as relaxed as Hallsworth himself, who you’ll often see him in the open-plan kitchen, wearing just his cargoes and T-shirt under his blue & white striped apron; menu headings range from Robata BBQ through to Junk Food Japan and Something Crunchy – no need to brush up on your foreign languages to understand this menu! All promise to deliver something special, something that you won’t have experienced elsewhere; Kurobuta really are out there on their own, but in a good way. The dining experience itself is relaxed and informal, the waiting staff are extremely knowledgeable and passionate about the food they serve; when they tell you that the dish you’ve chosen is amazing, they’re talking from experience, not just a sales crib sheet. If you’re unsure as to what you’d really like, their personal knowledge of the dishes (and descriptions!) means that recommendations are easily found – why not just let them choose a variety of dishes for you? Scott has brought a wealth of experience to the business; from cooking for the Beckhams in Madrid to supplying the catering for Chelsea football club’s most famous of patrons, Roman Abramovich (with a little bit of Michael Jackson in-between).